As we are heading into colder weather, we will need a bowl of hot, comfort food more often. This is where the piping hot Chinese Tomato and Egg Noodle Soup comes in! This one bowl of goodness can be made in just 30 minutes and it will be gone faster than that, because you can’t stop slurping the goodness up! 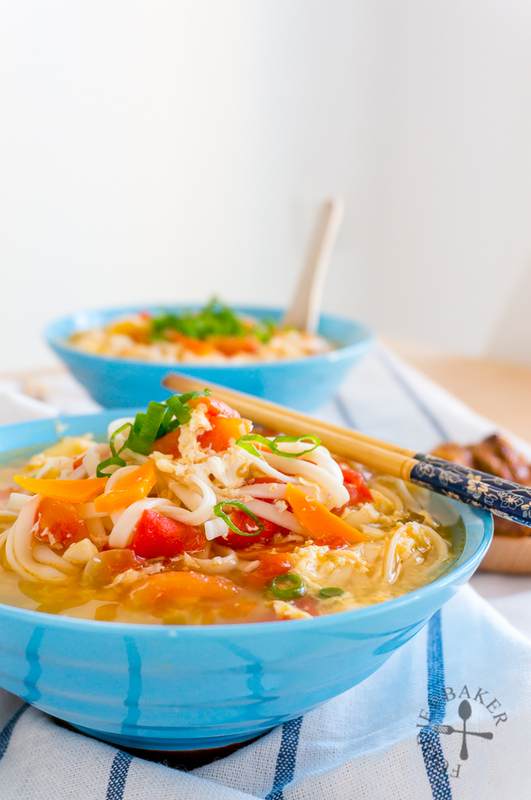 A bowl of goodness with no MSG, just pure goodness! P.S. This is a scheduled post as I’m currently away on holiday in Eastern Europe! Thank you for visiting and my apologies as I won’t be able to visit your blogs during this period. Do follow me at Instagram and Facebook to see what I am up to (I swear I am up to some good)! Do you know that tomatoes have plenty of umami components? By cooking tomatoes in the soup, it will add tremendous flavours (and a beautiful reddish colour) to the soup! 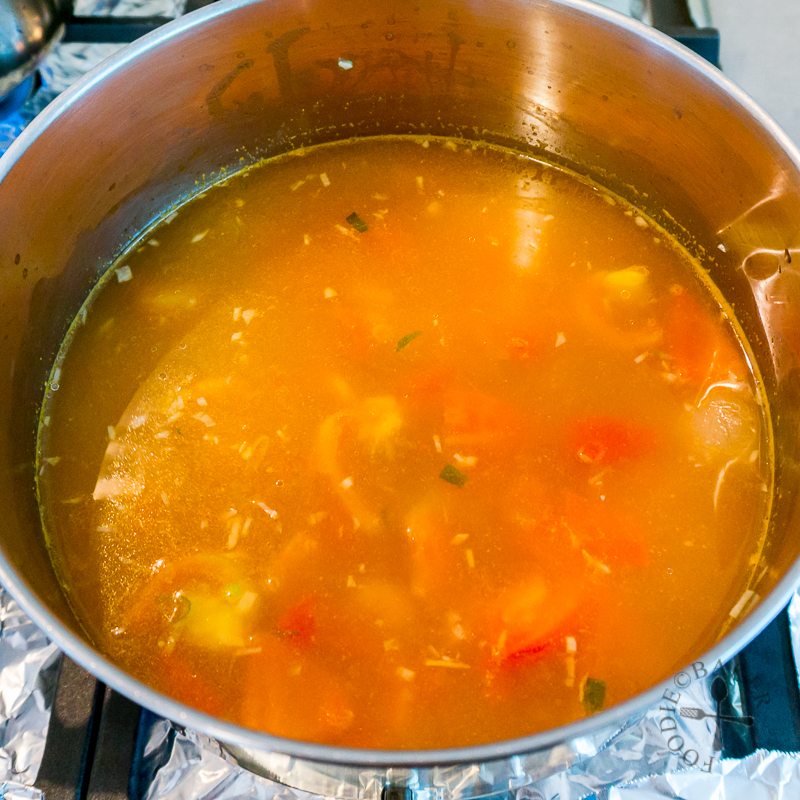 If you use sour-ish tomatoes, the soup will have a slight sour-ish taste which helps stimulates the appetite. I used vegetable stock for this recipe, which is simply the leftover water after boiling potatoes the previous day (the potatoes were used to make yummy baked fries). 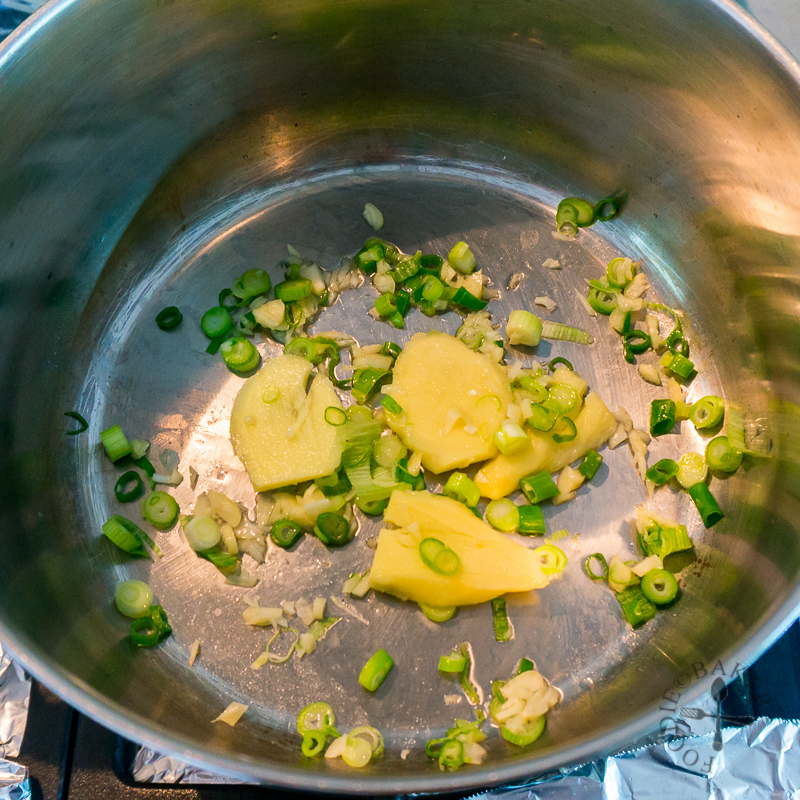 Ginger, spring onion and garlic are given a light sauté in a bit of oil to add additional flavour to the soup. I resisted adding any meat into the soup (which was incredibly rare), and served the noodle soup with some ngoh hian (five-spiced pork rolls) on the side instead. 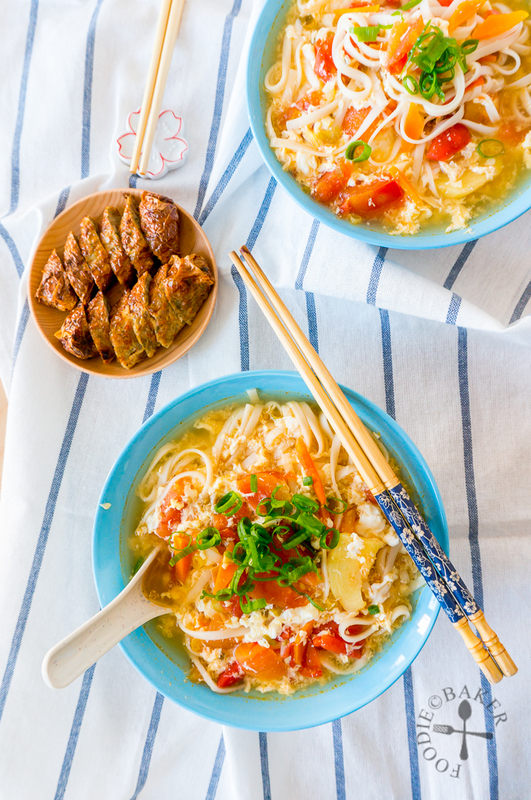 It was a light and delicious meal that we finished everything – from the noodles down to the last drop of soup! 1) In a pot, heat oil over medium heat. Add in ginger, white part of spring onion and garlic and sauté until fragrant. 2) Add in tomatoes, carrot (if using) and a pinch of salt. Cover and cook, stirring occasionally, for about 5 minutes until the tomatoes are soft and mushy. 5) Drain the noodles well and add into the soup. Turn up the heat and let the soup come to a rolling boil. 6) Beat the eggs in a small bowl then pour slowly into the boiling soup. Taste the soup and season with salt to your liking. A bowl of goodness that you can’t stop slurrping up! In a pot, heat oil over medium heat. Add in ginger, white part of spring onion and garlic and sauté until fragrant. Add in tomatoes, carrot (if using) and a pinch of salt. Cover and cook, stirring occasionally, for about 5 minutes until the tomatoes are soft and mushy. Add in stock and soy sauce. Bring to a boil, then cover and simmer for 15 minutes. 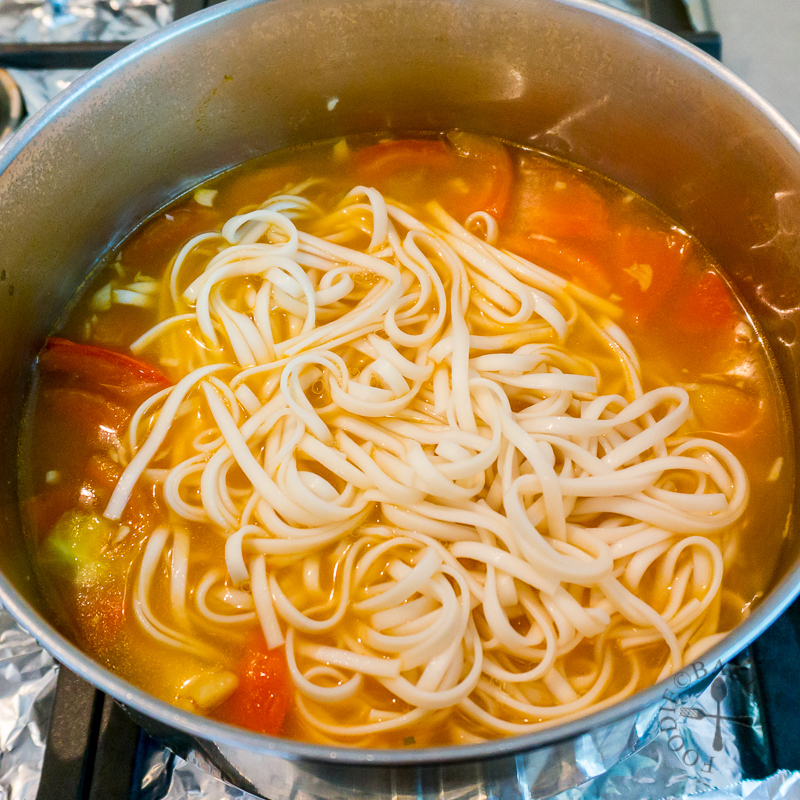 While the soup is simmering, bring a pot of water to boil, add in a generous pinch of salt and add in dried noodles. Boil until the noodles are soft. 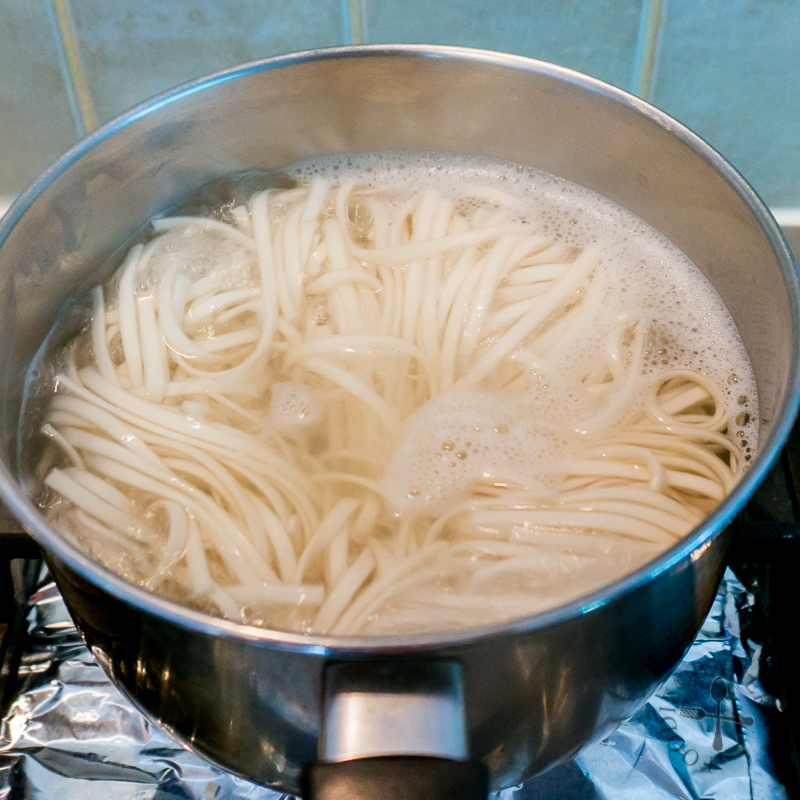 Drain and rinse the noodles briefly under cold water, then drain the noodles well and add into the soup. Turn up the heat and let the soup come to a rolling boil. Beat the eggs in a small bowl then pour slowly into the boiling soup. Taste the soup and season with salt to your liking. Turn off the heat. Divide lettuce between 2 serving bowls. Ladle the soup and noodles into the serving bowl. Garnish with the green part of spring onion, drizzle with a few drops of sesame oil (optional) and serve immediately. - You can use egg noodles, ramen noodles or even fresh hand-made noodles for this dish. 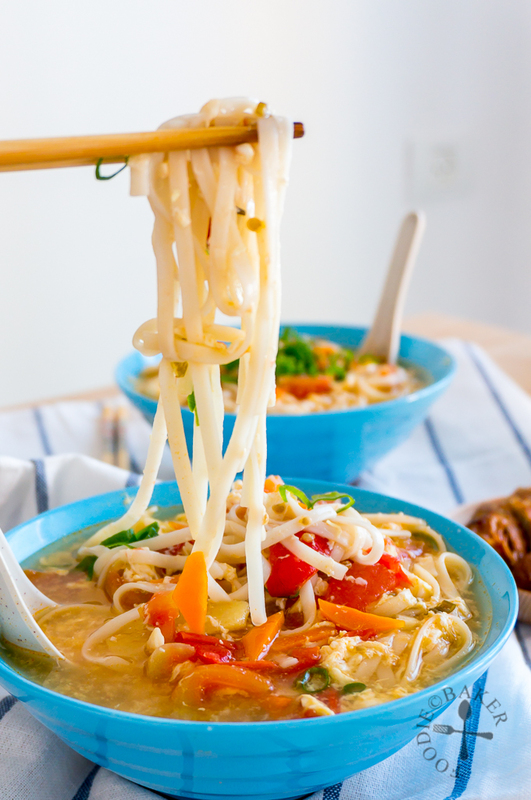 For fresh noodles, you can skip the boiling part and them straight into the soup. 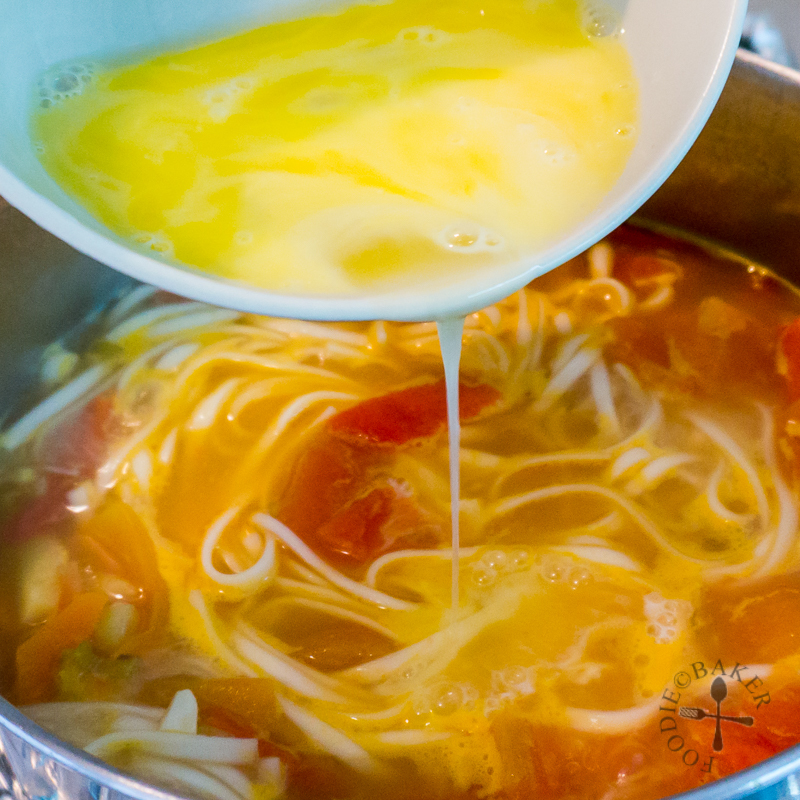 Boil for a few minutes until the noodles are cooked before adding in the eggs. - Make Ahead: Make the soup base ahead of time (until step 3). When about to serve, reboil the soup and proceed with remaining steps. We certainly are entering soup season, Jasline, and this would make a nice addition to my soup recipe inventory. 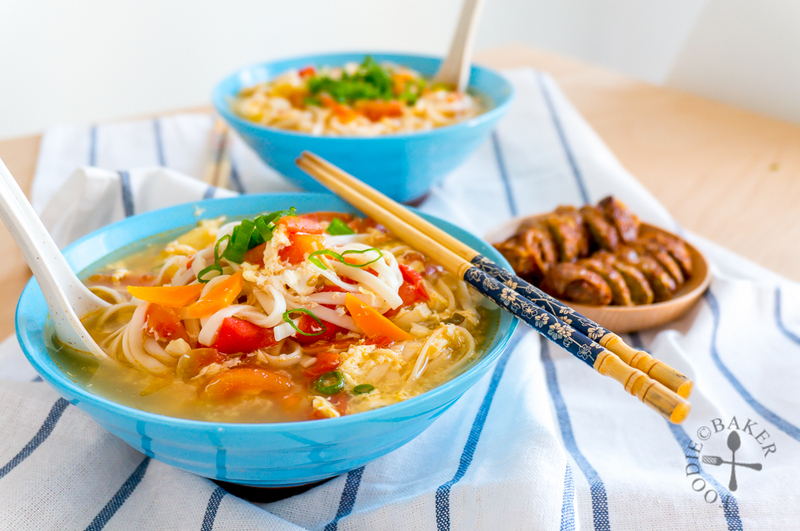 Love the idea of mixing tomato and egg drop soups. Can’t wait to give it a try. Thanks! what nice and lovely recipe Jasline !! And always love yours pictures are beautiful!! I would love to slurp this anytime, Jasline! 🙂 Sounds just perfect to me!